A party appetizer that is loved by all at my home. After a couple of trials, I have settled with this recipe. 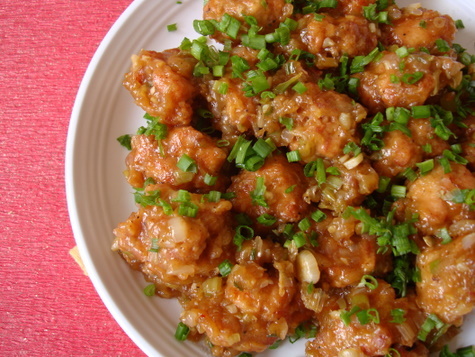 The secret to a flavorful Chicken Manchurian is the use of chicken stock. Marinated boneless chicken is deep fried and the golden balls are tossed with a cornflour based ginger-garlic concoction and garnished with a generous amount of spring onion greens. Serve hot to savor the true flavor of this Indo Chinese starter. 1 Heat oil in a heavy bottomed vessel, make small balls of the marinated chicken and carefully drop into the hot oil. Cook on low medium flame and towards the end of the cooking process increase flame to high and deep fry to a golden brown shade. Drain with a slotted spoon and place on absorbent paper. Keep aside. 2 Heat a heavy bottomed vessel, add oil, add the chopped garlic and saute on high flame for about 30 secs. Add the chopped ginger and green chillis and saute for a few more secs. Add the spring onion whites and saute for 3 mts on high flame. 3 Reduce to medium heat and add the brown sugar, soya sauce, tomato ketchup, chilli sauce and vinegar. Combine well and cook for 2 mts. Add 1/4 cup chicken stock or water and cook for a mt. Add the deep fried chicken balls and cook for 4 mts. Adjust salt, if necessary. 4 Add the cornflour water and cook, tossing the contents, for 4-5 mts. You will find that it becomes thick due to cornflour. 5 Add the chopped spring onion greens and combine. Garnish with more spring onion greens. Serve hot as a starter/appetizer. Wow Sailu..What an appetiser…I am so glad you blogged this today cause I know whats coming next. Thank you so much for posting such delights. The top white part of the pring onion little more than 1/4 of it… whatver part is a light color and NOT green. Only 250g of chicken? Is that correct? Yes, it can border between 250 to 300 gms. thanks sailu for the wonderful recipe for a cold evening. i just started making it. i know it is going to be very tasty. its awesome sailaja garu. a small request, why dont u post some drinks like juices esp healthy ones. i want to know abt vegetable juice. can u post the recipe? Happy 2010 to you and family Sailu. I tasted the Gobi Manchurian in Bangalore, was so yummy and I tried at home here too, loved it. Got to try with chicken, looks fab. Yummy. I love Vegetable Manchurian. Used to be dinner when i was in Hyd. Love this version. I too tried so many recipes but never got that restaurant taste. Will try yours soon. Can we replace chicken with any vegetables? Please let me know. You can make Vegetable Manchurian. Avoid egg white in the marination. Grate carrots, chop cabbage, beans and green peas. Follow rest of the recipe. Will blog the recipe. WOW!!! That looks so yummy!!! Delicious & mouthwatering…. I have saved it for my future ventures….. I would love to try & savor it all, myself…… Thanks for the guidance..
Chicken 65 is also same, except you must not add vinegar, soya etc. 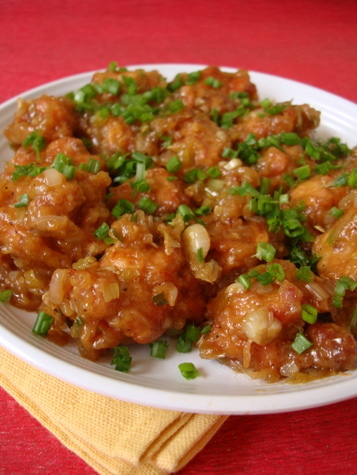 That’s a wonderful recipe of Chicken Manchuria. I have a small doubt. You said to make chicken into fine pieces, you mean like kheema or it has to be 1″- 2″ inch pieces?? I am going to try this soon. Pl. reply me ASAP. Thanks. The chicken need not be like kheema, however, it should be smaller than 1″ pieces. Slightly bigger pieces than in Kheema is good enough. Many thanks for posting this recipe. It was close to restaurant taste and came out really really well. Adjusted the quantity and the spice level as per our need and it was very delicious. Had prepared this during the weekend. It turned out extraordinarily delicious. My husband, who is hard to impress, said it was far better than any restaurant’s version. Thanks for such a wonderful recipe Sailu. I have a request, can you please post the recipe of Shahi Tukda? Really enjoying your chaat series. Keep up the good job. Spring onions are available in rythu bazaar and most food stores like Spencers. You can use white sugar in place of brown sugar. i’m just surviving with ur recipes….my hubby is too picky. all the time i’m looking and trying ur mouth watering dishes.. u r doing a gr8 job.. Very nice blog!! you said to use tomato sauce… is it tomato ketch up or canned tomato sauce(US)? and is it dark soy sauce or light soy sauce? please let me know. I want to try it. You can use tomato ketchup and light soy sauce. so for the corn flour do you mean corn meal or corn starch? because i know some other recipes call for corn starch. Can we use corn meal?? No, corn meal will not work. Corn flour/starch is best. What is Chicken stock? Tried your Gobi Manchurian recipe. It was delicious. Thanks a million for you work. It is a life savior. The recipe mentions to use chicken cut in small pieces. How can that be made into balls? Should one use ground chicken? The chicken should appear like lamb kheema (slightly bigger pieces than in kheema). You can use ground chicken too. Tried ur chicken manchurian. Its delicious like the reastaurant one. Thanks!! I scrolled down and read other comments!! So corn starch it is!! OMG … First time I tired cooking anything and I tried this and this came out awesomeeeeeeeeeeeeeeeee … I mean, the instructions were very clear and it was perfect the way it came out as well. Thanks. I tried this recipe yesterday. It was very tasty. You ask to use red chilli powder- but in the process, you don’t say when to use it? Hi Sailu! Where does the green chilis stated in para.2 above, come from? It is not in your list of ingredients!! By pepper powder, do you mean black pepper? My chicken turned super hard after frying. What did I do wrong? I followed the instructions closely. Also, I marinated for 1+hr and the chicken was still dry from the inside. You probably added too much of flour. Recipe looks wonderful :). Thank you for sharing. Quick qs: If we don’t have sesame oil, can we subsitute with something else or sesame oil makes a difference? Then I will buy it accordingly. Also, for chicken stock can we use maggi chicken stock? But the problem is that the packet says for one stock you need half litre of water. That’s a lot of stock and the recipe only needs a few tablespoons. Any idea what we can do? I made this as I usually get Mandarin Chicken from a Hakka restaurant that I love. I had to tweak the recipe but it was actually pretty close. I just chopped the chicken into small bite size pieces – marinated and fried them. they were tasty and moist on their own. I find the recipe a bit hard to understnad so i improvised. It should be proof read because there are lots of problems. Firstly…are you suggesting mincing the chicken and making blls out of it? that would be ground chicken and wouldn’t brown up like diced chicken. You never say where to use the chili powder. 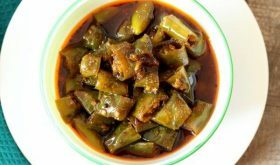 Green chilis appear in the first part of the recipe without being noted in the ingredients list. Is tomato sauce the same as ketchup??? Sesame oil is noted int he ingredients b ut never shows up in the recipe per se. Proof read! Can we stir/pan fry the chicken instead of deep frying it? Of course not! U need 1kg to feed 5 persons.. Yes, if you do not have it, use lemon juice. I made this for my family and it turned out great..thanks a lot for the wonderful recipe.. Thank you Sailu ~ this turned out very good. It had the right tastes, look and texture and I couldn’t believe I had made it so pretty good! Really appreciate your recipe.